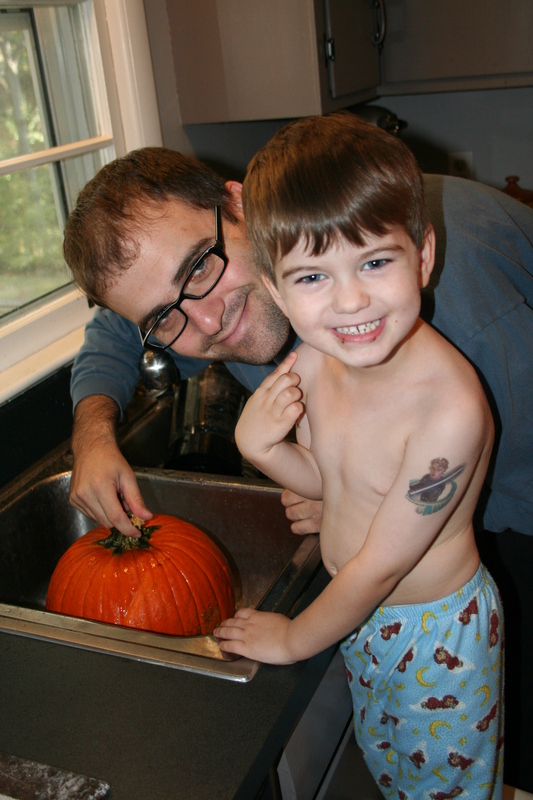 When our first son was born and Halloween rolled around, we weren’t sure what to do. Is it a pagan holiday? Were we teaching our son to worship satan? Couldn’t we just celebrate Reformation Day instead? We were torn and had no idea what to do. We got by with making no decision the first couple of years of his life because he was so young. However, as our boys got older and fell in love with costumes of all kinds, we let them wear costumes they already had and headed to the local Trunk or Treat near our home. At that point in my life, I had read Treasuring God in Our Traditions a few years prior and was searching for a way to redeem the holiday. I had found ways to redeem Thanksgiving and Christmas, so why not Halloween? If you haven’t noticed already, we’re a great fan of books around our house. Surprise, surprise I was introduced to books that became a wonderful avenue for redeeming Halloween in our home. 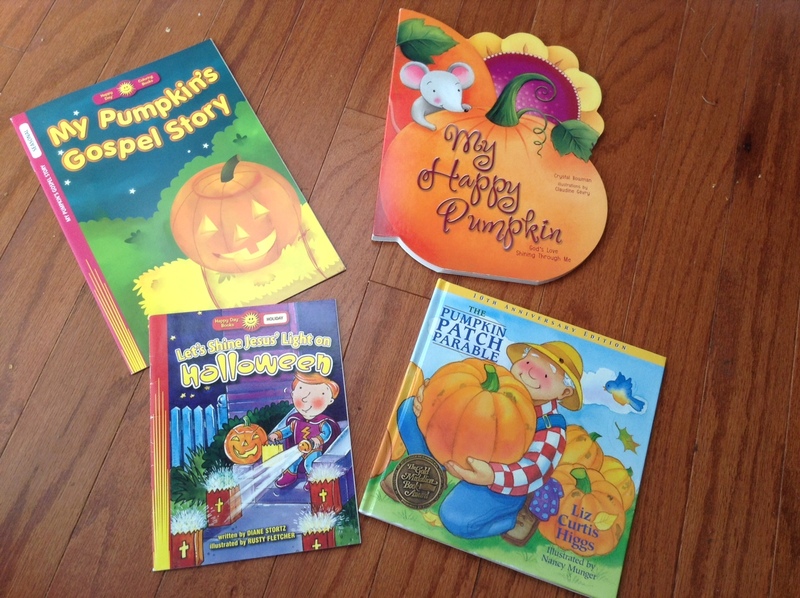 The books shown above have become traditions in our home particularly with pumpkin carving, and if you’re carving a pumpkin sometime this next week, I introduce them to you as well as a way of redeeming Halloween in your home. 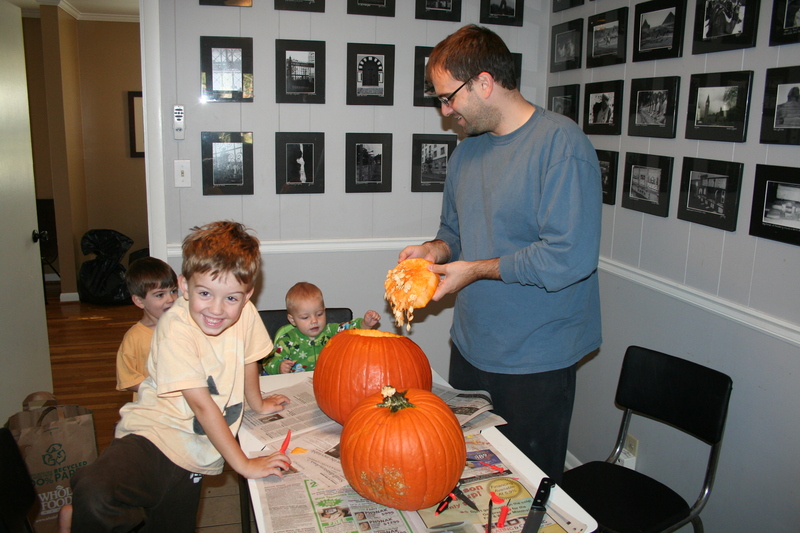 The Pumpkin Patch Parable , My Pumpkin’s Gospel Story and My Happy Pumpkin: God’s Love Shining Through Me all creatively use the activity of carving a pumpkin as a way to explain the gospel story. I heard about these books before using these with our boys, and I was a bit cynical. (I’m quite the cynic at heart.) The gospel and a pumpkin?? Seriously, I scoffed. However, when I first bought these books and used them for the first time 3 years ago with our oldest 2 boys, my eyes were a little misty while reading the book. The imagine of God removing my sin as far as the east is from the west became all too clear as we moved the inside yuckiness from our pumpkin and put it in the trash bag–taken away forever. All of the books end with the encouragement to let Christ’s light shine through us. This is obviously the theme is this favorite, Let’s Shine Jesus’ Light on Halloween , too. No, the gospel is not a pumpkin, and yes, our sin is MUCH more terrible than pumpkin innards, but a tangible picture for a child of a concept that is difficult for them to grasp, I’ll take it! Win-win! More food for thought reading about redeeming Halloween–see this post, which was the impetus for our church plant passing out hot chocolate and candy in neighborhoods the past 3 Halloweens. No condemnation meant towards those NOT doing this. 🙂 Just another idea to SHARE (in keeping with my blog theme!) and thankful for how reading that post has shaped our family and our church. 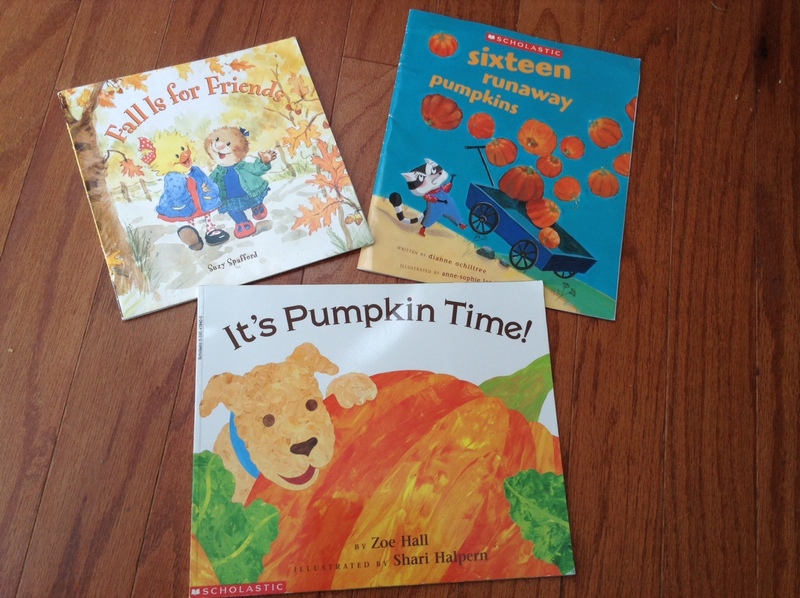 And…just for fun, these are 3 of our other favorite Fall/Pumpkin-themed books: Fall Is for Friends ,Sixteen Runaway Pumpkins , It’s Pumpkin Time!